I was born into a Catholic family but not necessarily into the Catholic faith. My family attended Mass on Christmas and Easter and while our religious education classes were in session, yet I have no memory of discussing with my family what it meant to be Catholic. We prayed together ONLY during thunderstorms. I was so unaware of what was in Bible that I was in my 30s before realizing the readings at all the Masses were indeed Scripture! In 2005, my life completely changed when I was invited to a bible study at a friend’s home. There I started to read and learn about the beauty of studying Scripture, and developing a relationship with Christ. 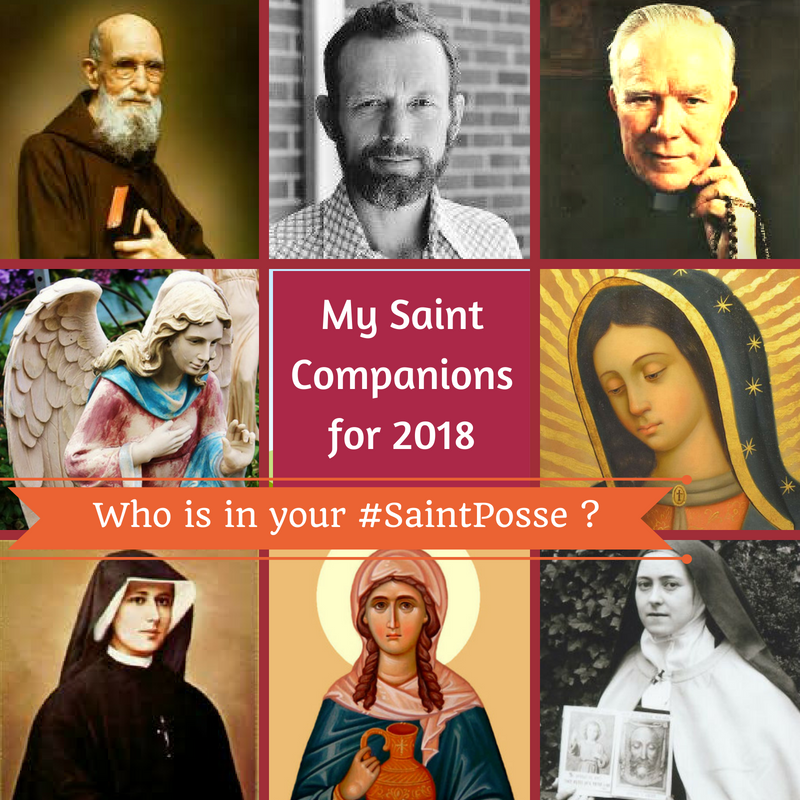 Then came a moment when I was faced with making an important decision of faith – stay Catholic or follow my very best friends into the Evangelical Church. Although, I loved them and even loved the music, services and fellowship of their church, it was not enough to call me away from the Catholic Church. What followed was years of prayer, study and discovery of the faith I grow up with but until I embraced it for myself finally grow into! 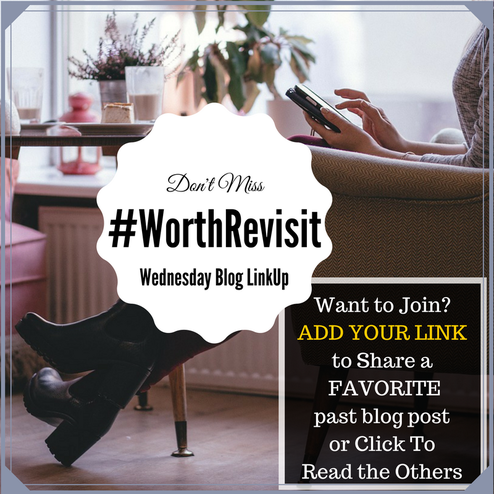 Every day I discover something new about the Catholic faith making on of my favorite Catholic Women Blogger Network’s Blog Hop topics (scroll down once on the CWBN Hop page to find this gem): Why I Love my Catholic Faith, one of my all-time favorite CWBN blog shares! My Guardian Angel gets a pretty vigorous daily work out enlightening, guiding, protecting, and leading me! Venerable Fr. Patrick Peyton aka The Rosary Priest. My goodness what hasn’t this man helped me with! Radio, World Youth Day, finding an amazing Confessor! He is buried in the next town, so I am able to pilgrimage to pray with him often! 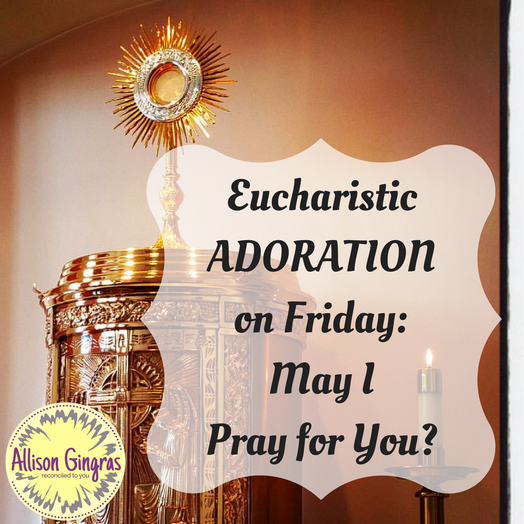 My road to sitting with Jesus in Adoration began nearly 10 years ago. Quite, some might say it was serendipitous but after these many hours in His presence, I would say this has the Holy Spirit’s finger prints all over it!! My husband and I, along with our kids, had just made the transition to this new Church. It was actually where we met and were eventually married, but we’d not worshiped there since our wedding. We had moved out of town, and spend many years at my childhood Church until circumstances arouse that made it clear it was time to find a new place to call our Spiritual Home. I was going through a very difficult time spiritually, emotionally and mentally – and in hopes of accelerating the healing, I began attending daily Mass as often as I could. One morning, as I was leaving, a woman I knew very well from the Church was sitting chatting with a friend on the little stone wall right outside the lower church’s doorway. She looked up to greet me, with a warmth that I rarely encountered anywhere else in my life. After initial niceties, and we catching up on her daughters, she asked me if I had signed up for weekly adoration yet. I felt a little embarrassed as I didn’t know much about Eucharist Adoration, and definitely had no desire to spend an entire hour sitting by myself in the musty chapel. ​Each Doodad has a story to tell. These remind me of the many blessings God has bestowed and serve as a reminder to pray and remember that I am never alone. In this world and in the one still veiled from my eyes exist a plethora of blessings and grace to sustain me on this journey. 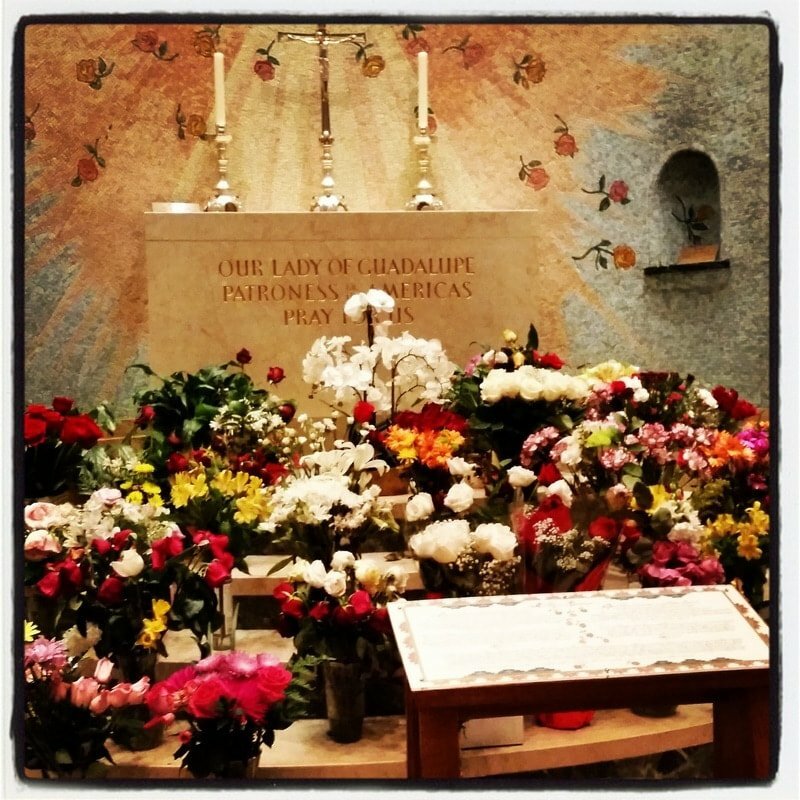 One of my favorite aspects of the Catholic faith are what we call Sacramentals. These are not lucky charms or magical tokens but beautiful, sometimes quirky, outward signs of the grace available to us from God though prayer, Sacrament and Scripture. 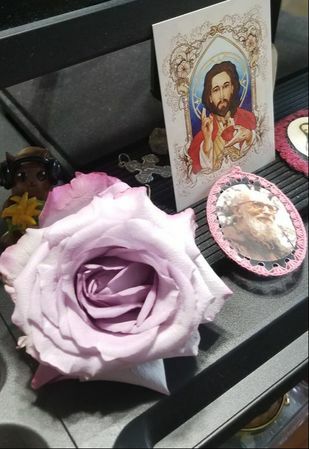 The Infant of Prague statue was salvaged from a dusty dried planter my sweet 90 year old Godmother had in her home shrine (I think it is a Portuguese thing). He was GLUED to floral foam! We freed him and cleaned him off. The Novena to the Infant of Prague has been instrumental in our tumultuous financial struggles! 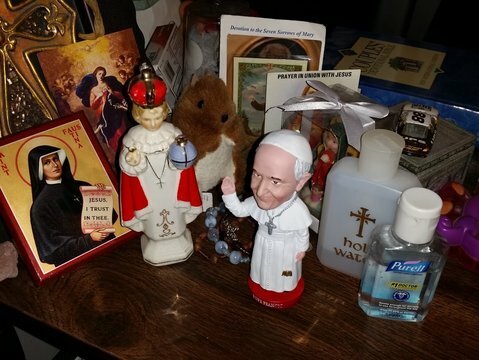 Pope Francis bobble-head was a gift received after presenting a women’s retreat on trusting God. He just makes me smile. It also serves as a reminder to pray for our pope and all the clergy that have said yes to God and guide us to heavenward! Baptism, Reconciliation, Confirmation, Matrimony, Holy Orders, Anointing of the Sick, and most importantly, the Eucharist. Outward signs of God’s grace. Probably the less understood aspect of my Catholic faith until my ‘reversion’ in 2006 for most of my early Catholic life (okay, this ignorance went well into my 30’s)! Grace, the undeserved, yet freely given gift of God’s Holy Spirit within us abounds in the reception and participation of the Sacraments. 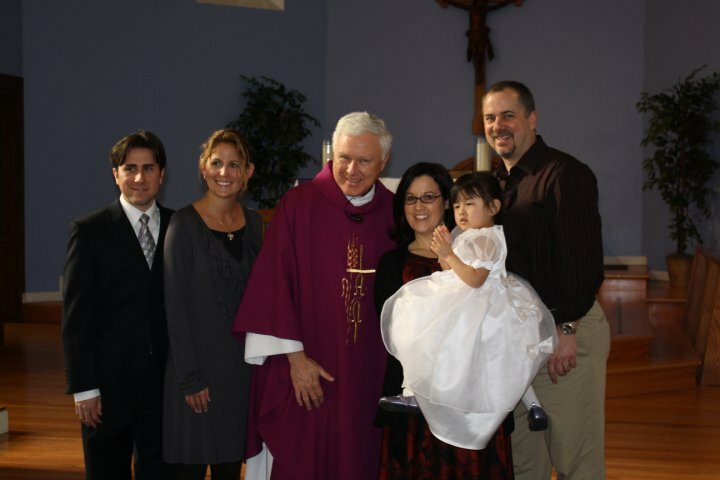 Even though we receive only once – Baptism, Confirmation (and for some Matrimony and/or Holy Orders) – continue to pour out grace into our lives. It was not until I was faced with a crisis of faith and investigated why the Sacraments existed in the Catholic Church did I learn what an incredible GIFT they truly are! What about you? 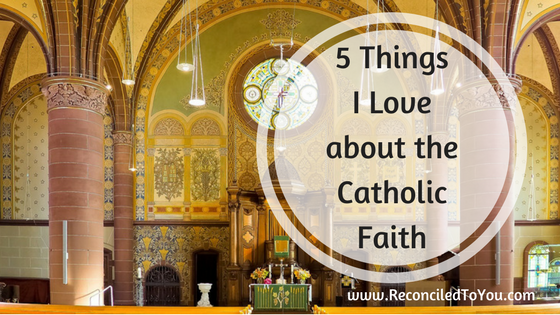 What do you love about your Catholic faith?